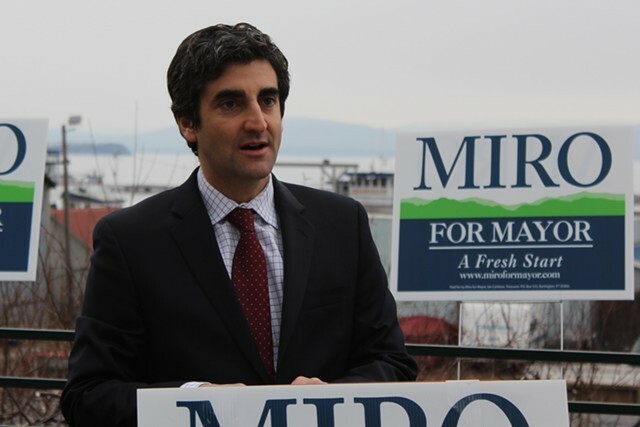 File this under the category of unplanned — but unsurprising — announcements: Miro Weinberger will run for a second three-year term as Burlington's mayor. The election isn't until next March, and there won't be a campaign kick-off until January. But when Burlington Free Press reporter April Burbank asked Weinberger in an interview last Friday whether he planned to seek another term, he said he did. "Rather than dodge the question, he was just very transparent," explained Mike Kanarick, Weinberger's chief of staff and his campaign spokesperson. "It was not a formal announcement by any means," Kanarick said, speaking by phone on Tuesday. City Councilor Kurt Wright (R-Ward 4) said he was sitting next to the mayor at a city meeting on Monday evening when Kanarick told his boss that the Free Press had posted a story about his reelection bid. "He looked kind of sheepish" about having spilled the beans, Wright recalled. The councilor (who lost to Weinberger during the 2012 election) said he told his former opponent, "What's the big deal? Everyone knows you’re running." Wright, who has made it clear he doesn't plan to make another bid for mayor, gives Weinberger good odds in the 2015 election: "I think that a Democratic incumbent mayor is just going to be tough to beat. Unless they’ve really screwed up ... voters aren’t going to throw someone out on their first term." And, he acknowledged, "I think people generally like the direction that the city is going." Weinberger identified improving the city's finances as a main priority during his first term. During his State of the City address in April, he declared, " ... we have turned the corner," citing improved credit ratings, increased financial transparency and the Burlington Telecom settlement agreement, which, if approved by the Public Service Board, could resolve a $33 million dispute between the city and Citibank. While the mayor won't start campaigning for several months, that doesn't mean he won't be padding his war chest in the meantime. That work began at least as early as last October, and in November, Seven Days reported on a fundraiser Weinberger held at Bluebird Tavern. According to a disclosure report provided by his campaign on Wednesday, Weinberger raised nearly $42,000 between October 2013 and July 2014, including $14,000 on November 13, the day of the Bluebird fundraiser. The campaign has spent about $21,700 since July 2013, including payments of roughly $6,000 to the Bluebird Tavern, $4,000 to Kanarick and $2,000 to another campaign staffer. Asked whether the campaign would continue to fundraise during the upcoming months, Kanarick, after a long pause, responded, "Likely." Given Weinberger's comfortable position, Wright doubts that the Republicans will put up a candidate. "My gut instinct is most people are going to look at this and say, this is not a winnable race." The Progressive Party hasn't come to that conclusion. Emma Mulvaney-Stanak, who chairs the state party, said they are just starting to look for candidates for both the mayoral and city council races because they've been focused on the general election coming up in November. But she hopes a Progressive will step up to the plate. Having options, she continued, is "what democracy is about." In Burlington, there will be more at stake for all three parties on the next Town Meeting Day. In the past, only seven of the 14 councilors come up for reelection each year, but next year — because of redistricting — the number total of seats will be 12, and they will all be for grabs in March. That might make decisions about where to devote resources more difficult for the Progs, suggested City Councilor Max Tracy (P-Ward 2). Tracy and Mulvaney-Stanak cited affordable housing and livable-wage jobs as two areas where they'll be watching the mayor. For now, though, the city council is, for the most part, getting along. "Overall we’ve kind of been able to move away from the really virulent and unfortunate negativity that marked the prior councils and towards a more collaborative approach," Tracy said. Correction: Story was corrected at 4:42 p.m. on 9/18/2014 to reflect the correct number of city council seats after redistricting.